A group of university researchers in the USA and China are exploring methods for fabricating electronic circuits on elastomer substrates that can be formed into tubes and fitted on users’ fingertips. 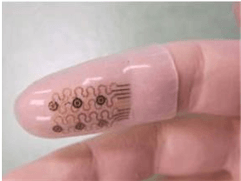 They envisaged applications such as electrotactile stimulation with arrays of silicon nanomembrane diodes, high-sensitivity strain monitoring with silicon nanomembrane gauges, and tactile sensing with elastomeric capacitors. The object of the research is to explore ways to incorporate these technologies in close-fitting, flexible finger caps, which could facilitate their practical use. According to the researchers, electrotactile stimulators and tactile sensors could provide bi-directional information links between humans and virtual environments, with potential applications in surgery, therapeutic devices, robotic manipulation, and other areas. Electrotactile stimulation, which results from passing suitably modulated currents into the skin tissue, allows information to be presented via artificial touch sensations, while tactile sensors measure pressure resulting from physical contact and provide information that could be used in feedback loops for electrotactile processes.